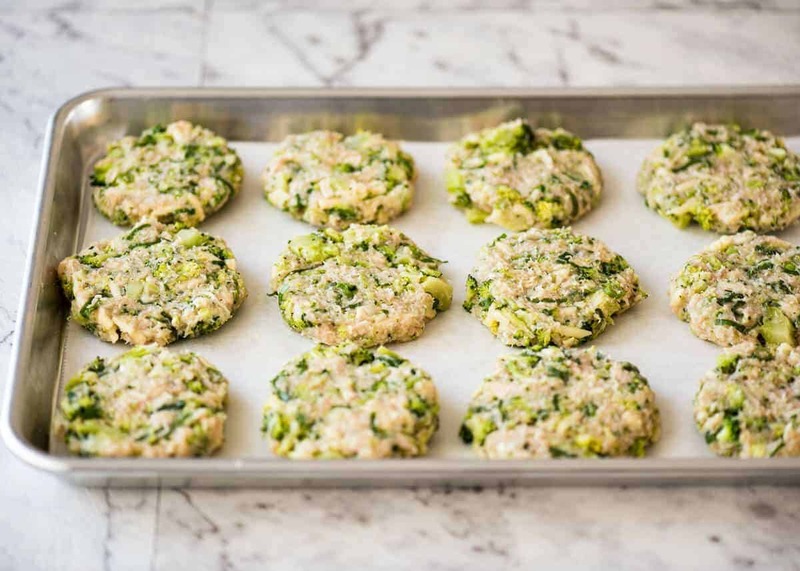 With a gorgeous golden brown crust and almost an entire head of broccoli in them, it’s hard to believe these Chicken Patties are BAKED, not fried! Once you start eating these, it’s hard to stop – they are just so, so good. 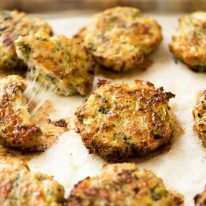 These are like the chicken and broccoli version of good ole’ Rissoles! Serve this for dinner with crusty bread slathered with butter and a side salad. Or put out a platter with a dipping sauce as a starter to share! 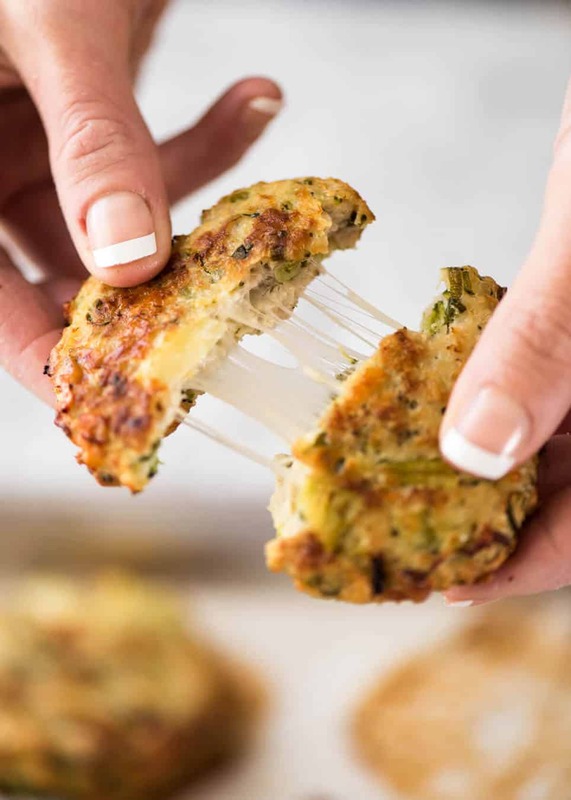 These are a variation of the ever popular Baked Broccoli Cheese Balls. When it comes to patties, I know it’s easy to automatically reach for the fry pan and oil. And to get a truly beautiful golden crust on patties – and fritters for that matter – you need a decent amount of oil. And it needs to be topped up. And you need to stand there, frying batch after batch – I’d probably cook this in 3 batches. And you need to keep the cooked batches warm. Bake ’em! They come out so golden and crispy! Hidden broccoli – an entire head! 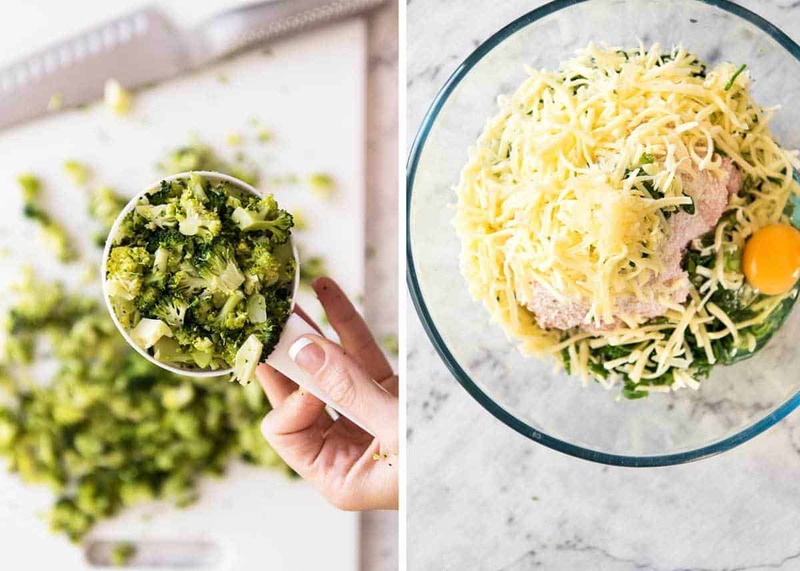 The chicken patties recipe calls for 2 cups of chopped broccoli. I know that doesn’t sound like very much but you’ll be surprised – it’s almost an entire head of broccoli. Once it’s soft cooked, chopped up, one whole head is about 2 cups. Jam packed, mind you! 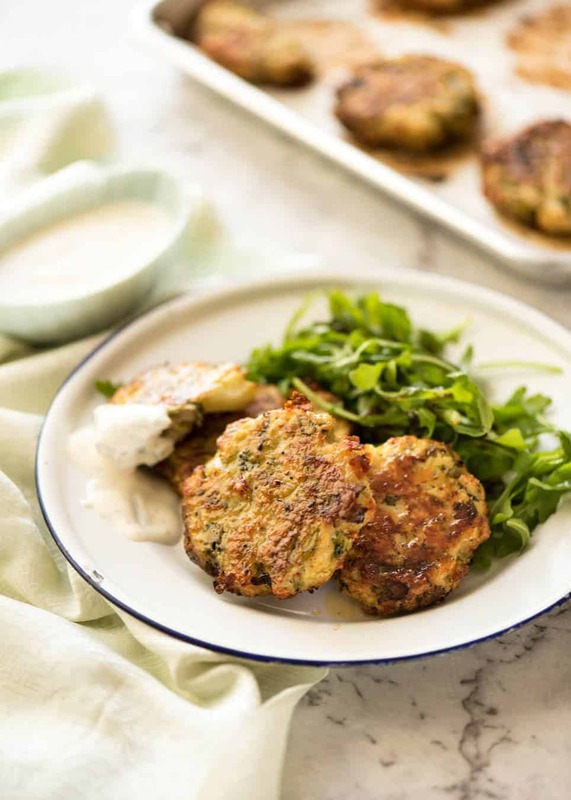 Though having said that, these chicken patties can definitely take more broccoli – or other shredded veggies for that matter. Think – carrots, grated onion, corn, grated zucchini (squeeze the excess liquid out in a dishtowel or paper towels), peas, finely sliced cabbage, even finely chopped green beans and asparagus. I’ve added notes in the recipe for how to do this. 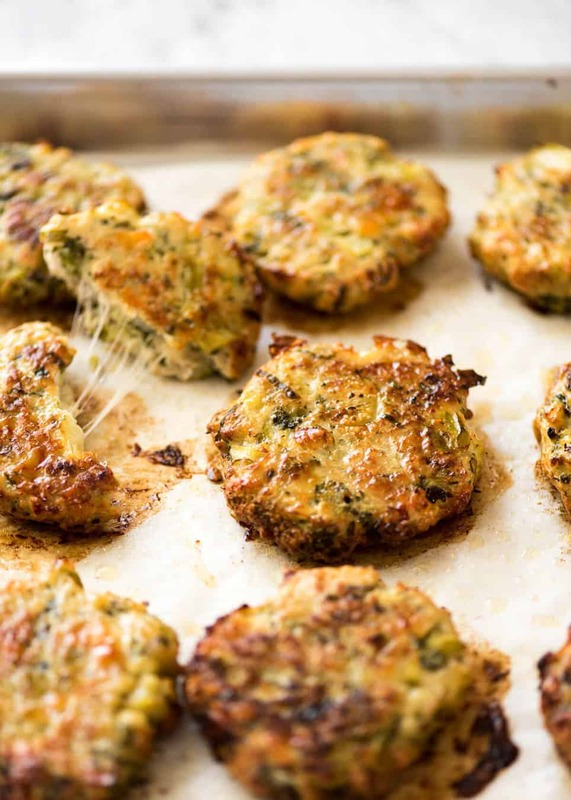 Well, you can’t call these cheesy patties without a good amount of CHEESE in them! It’s up to you how much you want to use. Burgers – Make bigger ones and use for BURGERS! Recipe video above. It's hard to believe these are BAKED not FRIED! 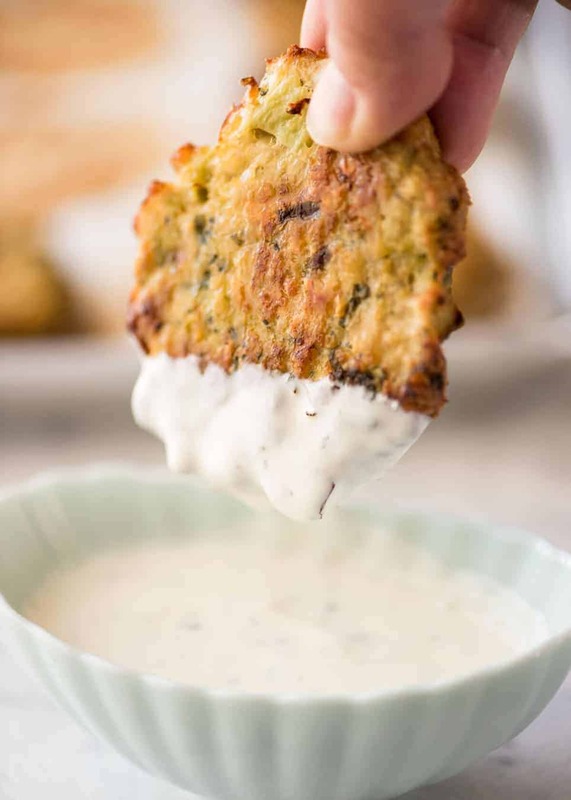 With almost an entire head of broccoli in them, these are juicy, cheesy and so irresistible. This makes 15 fritters about 6 cm / 2.25" wide, 1cm / 2/5" thick. Trying making burgers or meatballs! Preheat oven to 200C/390F. Line a baking tray with baking paper (or spray with oil). Place Fritter ingredients in a bowl, mix to combine. Measure out about ¼ cup of mixture and pat into fritter shapes about 6 cm / 2.25" wide, 1cm / 2/5" thick (they shrink a bit and become thicker). Place on tray. Spray the top (generously) with oil. Bake for 15 minutes, flip, spray with oil again then bake for a further 8 - 10 minutes until golden on top. Serve immediately with Sauce. Sauce: Mix ingredients together. Add salt and pepper to taste. Set aside for 20+ minutes. 1. Chicken mince (ground chicken) sold at supermarkets can be very wet. Always look for packets that doesn't have water in them (also indicates that it's not very fresh). 2. Broccoli - You will need about 1 medium head of broccoli, florets only. Cook using your preferred method until soft - I boil or steam. Then chop finely - see recipe video. You can use the thick stem if you want - peel the outside before cooking, once cooked, chop it very finely. 3. Mozzarella cheese doesn't have much salt in it. It stretches beautifully and that's what I used in the photos and video. You can use any cheese you want. BUT if you use a flavoured cheese like cheddar, colby, tasty etc, reduce the salt slightly. 4. MORE VEGGIES: This recipe can take about 1.5 cups of extra veggies. Suggestions: grated carrot or onion, grated zucchini with excess water squeezed out, corn, peas, finely sliced veggies like cabbage and spinach, finely chopped cooked green beans or asparagus. 5. 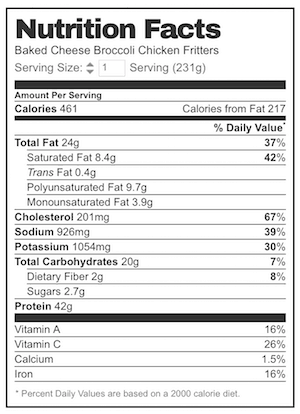 Nutrition per serving assuming 4 servings, excludes sauce. Recipe makes about 15 fritters. 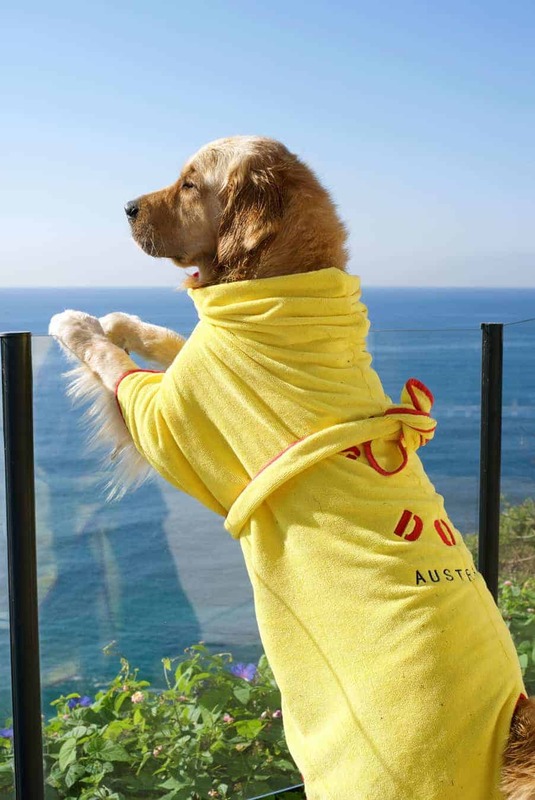 Update pursuant to reader requests: Yes the store that sells this robe ships overseas, no that is not an affiliate link, it’s an Australian owned independent small business that I’m happy to support. I’ve had that robe for years and it’s not showing any sign of wear at all. Nagi, I must admit that I doubted your recipe when I took the patties out at the 15 minute mark thinking “These don’t look golden on top.” I even started forming the doubtful comment that I thought I would need to write starting “I’m not sure what went wrong…” But I was corrected when I pulled the flipped over patties after another 10 minutes – golden on top, as if they were fried. I shouldn’t have doubted you 🙂 Thank you for another excellent recipe! I’m so glad they worked out for you Yvonne!! mascarpone, really stupid of me! so I used mature cheddar cheese which was in the fridge. As you said, other cheese could be used. I am very happy with the end product of cheddar cheese. Hi Nagi, love your recipes! Have you tried freezing these? Your recipe calls for shallots but did not use it on the video. Scallions are on the video instead. I want to make this today, I bought shallots as listed on the recipe ingredients. Can I use 3/4 cup of shallots? It sounds like a LOT. How much should I use? Hope to hear from you. Can I substitute frozen chopped broccoli? Do I cook the parties before freezing? Is the meat cooked before adding to the broccoli?